WWII RAF HOSPITAL - This humble wooden building in Lime Park, Herstmonceux, Sussex, served as a makeshift hospital for wounded airmen during World War Two. Officers were billeted at Lime House on the other side of the Park. The building as seen here is missing the rear section that housed the majority of machine emplacements. Fortunately, the majority of the building remains standing and the footings that until recently had loose crumbling brick walls, is now being repaired so that visitors to the site may gain an impression of the full extent of the installation of Charles William de Roemer. During WW2, the generating buildings at Herstmonceux served as accommodation for wounded RAF aircrew, working with the early warning radar station at RAF Wartling and RAF Beachy Head. RAF Wartling succeeded RAF Pevensey, continuing after 1945 into the 1950s Cold War period - closing in 1963. There is a brick built Anderson shelter in the grounds of RAF Herstmonceux. Outside the shelter there were two banks of batteries protected by brick piers (walls) that were covered with a 2" sharp sand slab. This battery store powered a radio transmitter, the aerial for which was to the left and forward in the picture above. In 1982, when these remains were uncovered and rescued from sycamore trees, all that was left of the radio equipment was a Morse code sender, a seriously rusted away transmitter/receiver and some of the lead-acid battery plates. These were completely different in make up to the much larger industrial batteries that were used 30 years earlier to store electricity overnight for the village. 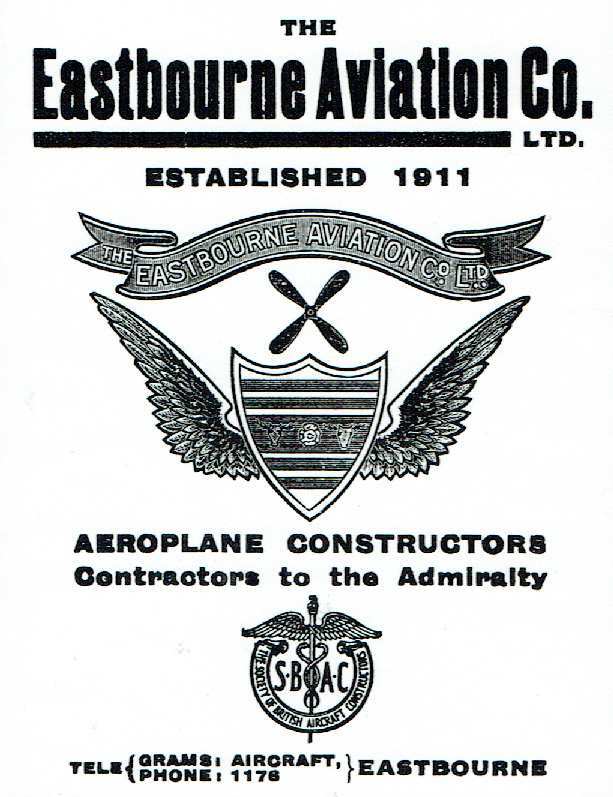 THE EASTBOURNE AVIATION CO LTD - Financed by Charles de Roemer of Lime Park, Herstmonceux, the EAC constructed aircraft for the British Admiralty (Royal Navy) from 1911 to 1924. The company was a member of the Society of British Aircraft Constructors, the SBAC. Telegrams (the then equivalent of an email) were to be sent to AIRCRAFT EASTBOURNE and the telephone number was 1178. If the company had continued to trade we feel sure that the heraldic symbols on their advertising banners and headed papers would have been registered as trade marks. RAF STAFF CAR - This beautifully restored RAF Hillman was on display outside the Horseshoe Inn on Saturday the 15th of October 2016, when the local Wartling and Herstmonceux Local History Group staged an exhibition of over 400 old photographs of the area. Copyright © 15 October 2016 Lime Park Heritage Trust. You will need the permission of the LPHT to reproduce this photograph except for private study or research. 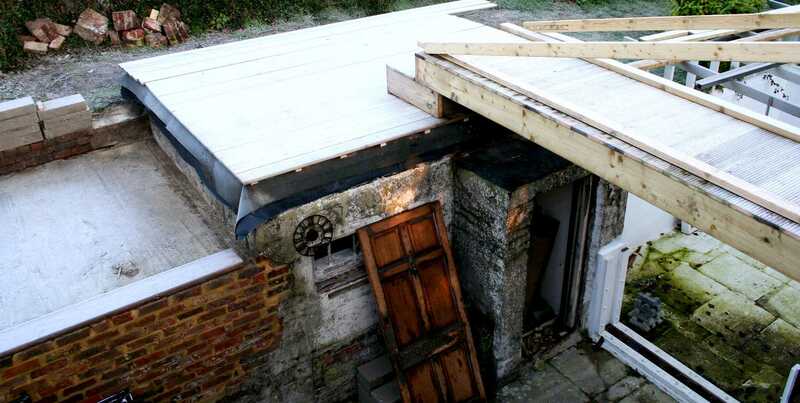 The bomb shelter has substantial steel (RSJ) girders to support the roof, much like the smaller shelter in the basement of Lime, part of the manor house across the Park. When discovered the roof was covered in about 12" inches of soil. A sycamore was growing from within the shelter, out through the doorway, with thick ivy obscuring the existence of the entrance, making it look like the side of a hill. The Anderson shelter was used as makeshift accommodation for a number of years between 1982-1988, then again in the 1990s. 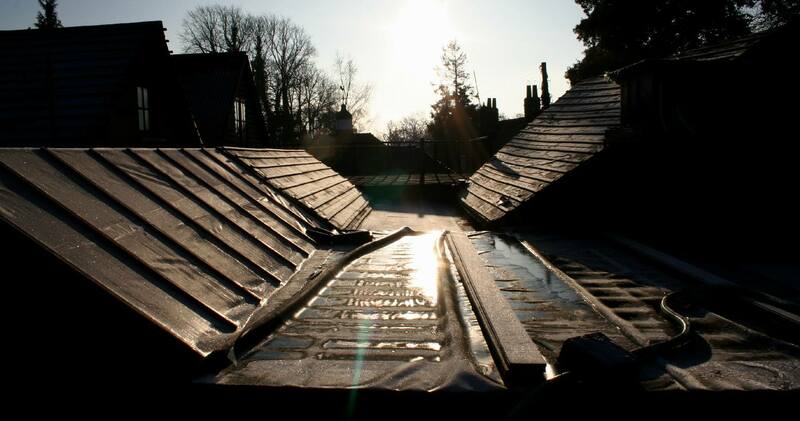 This use at least gave the occupier the incentive to install a waterproof roof, with a felt covering, to stop the freezing cycle during winter when water trapped in the cracks, froze, expanded as ice, and then made the cracks worse. Ivy was also invasive, getting behind the rendering and pushing it away from the brick walls. A number of red cross stretchers were found on site. The canvas was pretty moldy and the wooden frames eaten away by woodworm, but they could have been saved by treatments. Not realizing the value of this find, only the peculiar steel hinges were salvaged. Nobody mentioned about the RAF camp in the early years - and the link to RAF Wartling was not obvious. So, the wooden frames and canvas were burned. Lime Park Heritage Trust are friends with two landowners at the Pevensey marshes, who are custodians of the extant artifacts on site, and like us (our curator) have struggled with local authority to gain recognition. So well done chaps. DEVELOPMENT - The EAC also built this monoplane at their sheds on the Crumbles. WWI - The Maurice Farman MF.7 Longhorn was a French biplane developed before World War I which was used for reconnaissance by both the French and British air services in the early stages of the war before being relegated to service as a trainer - seen above at Farnborough. The "Longhorn" was a three bay biplane with a forward elevator mounted on upcurved extensions of the landing skids and an empennage carried on four booms consisting of biplane horizontal stabilisers with an elevator attached to the trailing edge of the upper surface and twin rudders. The airframe was constructed using a combination of ash and silver spruce, and many of the members including the outer interplane struts and the outrigger booms carrying the tail surfaces were hollow. It was powered by a Renault air-cooled V8 engine driving a pusher propeller mounted at the back of a fabric-covered nacelle. The propeller was mounted on the engine's camshaft, and therefore revolved at half the engine speed. Its name derived from the distinctive front-mounted elevator and elongated skids. WWII BOMB PROOF SHELTER - Also in the grounds at Herstmonceux Museum is this Second World War air raid shelter that was used by the RAF in connection with the hospital for wounded airmen and, presumably, to ensure effective communications for other MOD staff nearby, where the prisoner of war camp in the field next door (now a football field) was used to house captured Italian soldiers. Before the First World War and RAF Hertmonceux, Charles W de Roemer became interested enough in aviation to join forces with Bernard Fowler to produce aircraft at workshops on the Crumbles at Eastbourne in Sussex. He was a director of the EAC and being a Major in the RAF it is hardly surprising that he allowed Lime Park to be used by the RAF in World War Two. Where Charles W had ceased generating electricity by 1932, it appears that having the generating rooms underused that he had no difficulty in converting the buildings to a temporary hospice for wounded airmen. RED CROSS - In this building we found Red Cross stretchers from the Second World War. The building was originally built to store faggots. Faggots are thin sticks and branches that light easily, for the boilers that converted coal to gas for the gas engines that powered the Edison Hopkinson generators. Here you see the wooden frame and cross bracing, being treated with Ronseal Total preservative. PLYWOOD - Sheets of plywood 12mm thick are screwed to the wooden frame. We have treated the plywood as well, because we don't want woodworm or wet or dry rot to harm the historic timbers. How do I recognise dry rot? - Dry rot might appear as white, fluffy, cotton wool like growths or in white or grey sheets. You may also find grey or white branching strands, up to 6mm wide spreading on brickwork or behind plaster. Rusty red, pancake shaped, fruit bodies can also mean that you have a dry rot problem. Wood under attack from dry rot shrinks and splits in large brick shaped pieces across the grain and is dry and brittle. How do I recognise wet rot? - Wet rot is a fungal attack and can cause the surface of the wood to darken. Decayed wood splits along the grain and smaller cubes of wood are formed as a result. The wood may also become soft and spongy. Thin, brown branching strands of fungi may form on the surface of the timber under attack. How do you recognise insect attack? - Insect attack can be recognised by small, round flight holes on the surface of the wood or by tunnels in the wood. New holes will show clean, fresh timber inside them and fine, gritty powder can be seen on the surface or beneath the site of activity. BREATHER - A permeable membrane such as the Wickes product seen here will protect the sheathing and timber frame from external water penetration such as driven rain, while allowing moisture to escape from inside. The product can be used as a temporary weather protection for a few weeks during construction, prior to the completion of external brickwork or cladding but only has a limited UV tolerance - so get a move on. CLADDING - Finally, we clad this face of the building in feather edged boarding. This was supplied by Stamco in Eastbourne who also deliver free locally if you spend enough to qualify. During hostilities the building was covered in corrugated iron as a fire precaution. Originally the cladding would have been tongue and grooved boarding (as on other parts of the main buildings, but we could not afford to reproduce the original profile, so settled for feather edge boarding as a practical compromise, that still retains the charm and character that only wood can give. 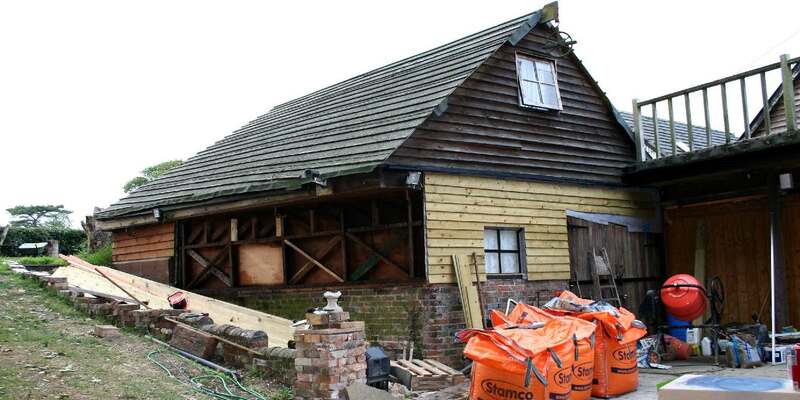 On a practical note, Wealden District Council were kind enough to confirm in writing that planning permission is not required to alter or replace a roof, or to repair an existing building. A number of trees were in dangerous proximity to the generating building complex and perversely included in a Tree Preservation Order the object of which appears to have been to shroud the generating buildings and choke them with roots, leaves, sap and bird droppings. This was a strategic planning ruse to deny the occupiers of the building a beneficial use promoted by one or two corrupted officers in positions of trust, who we are pleased to report are for the most part gone from this council. There are though one or two hangers on, who we hope may have turned over a new leaf. 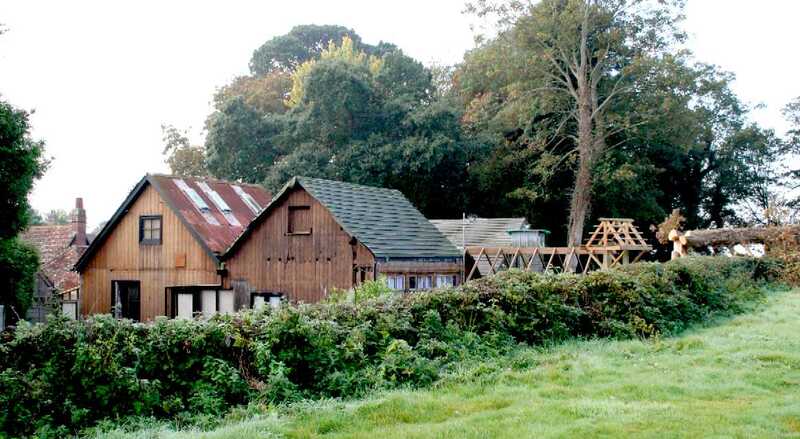 WASTED RESOURCES - It was the war between Wealden DC and one of the then occupiers between 1982 and 2008 that stalled restoration works, so preventing this historic jewel benefiting from works such as those seen above. According to an article that Wealden did not challenge as to accuracy in over 10 years, an audit of the council's financial records reveals that around £500,000 of ratepayers money was used to try and stop this building from being recognised for what it is. That money should properly have been used to help the restoration, but local politics and other interests appear to have got in the way. The council used their considerable powers to try and wear the occupier's down, causing them to spend their time in the law courts and at planning appeals - rather than caring for this very rare find. What are we like allowing such malpractice and how do such nasty people get into trusted positions. Fortunately, one of the occupiers proved to be made of sturdy stuff, going on to become a legend for his victories against those wayward officials - unfortunately - mostly for third parties and other premises. This restoration is testament to that courage in the face of enemy fire: the enemy within. Bully! BATTLE OF BRITAIN - Hundreds of buildings played a small part in the Battle of Britain and during the conflict that shook the world between 1939 and 1945. RAF Herstmonceux is just one of those surviving the conflict that lives to tell the tale. For example, RAF Northeye was originally built as a military camp during World War Two to house those working at the nearby RAF Wartling Radar Station before closing in 1958. RAF Northeye later became a category C prison, before being burned down during a riot in 1986. In 1992 the UAE moved in and rebuilt it as a training unit. 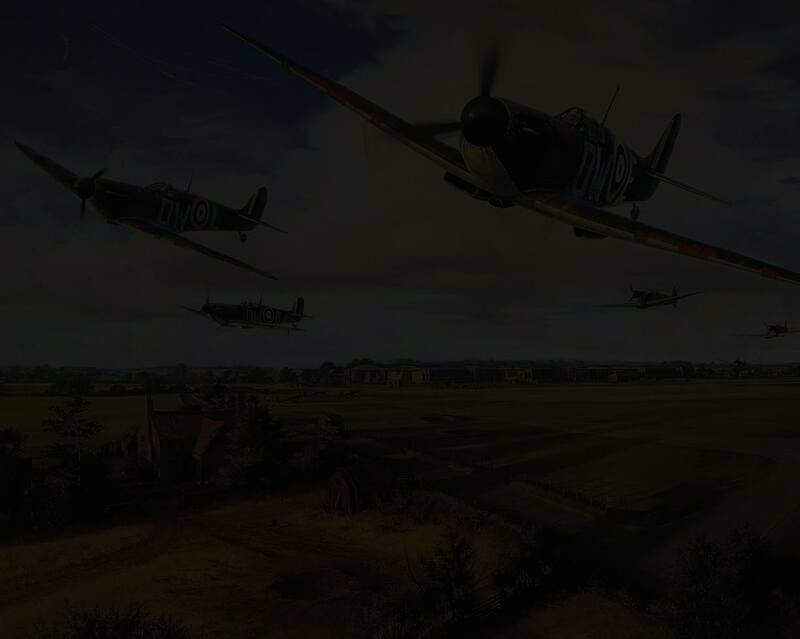 The Battle of Britain is a 1969 British Second World War film directed by Guy Hamilton, and produced by Harry Saltzman and S. Benjamin Fisz. The film broadly relates the events of the Battle of Britain. The script by James Kennaway and Wilfred Greatorex was based on the book The Narrow Margin by Derek Wood and Derek Dempster. 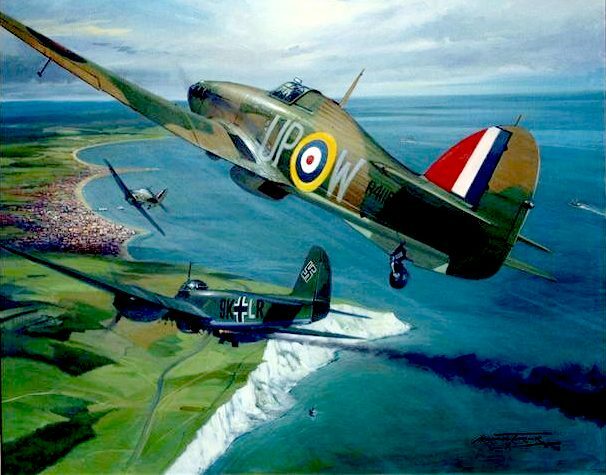 The film endeavored to be an accurate account of the Battle of Britain, when in the summer and autumn of 1940 the British RAF inflicted a strategic defeat on the Luftwaffe and so ensured the cancellation of Operation Sea Lion – Adolf Hitler's plan to invade Britain. The film is notable for its spectacular flying sequences, in contrast with the unsatisfactory model work seen in Angels One Five (1952) and on a far grander scale than had been seen on film before; these made the film's production very expensive. 1920s - Sam Hayward is seen here on the left standing by their (then) latest addition to a delivery fleet that was previously horse drawn. 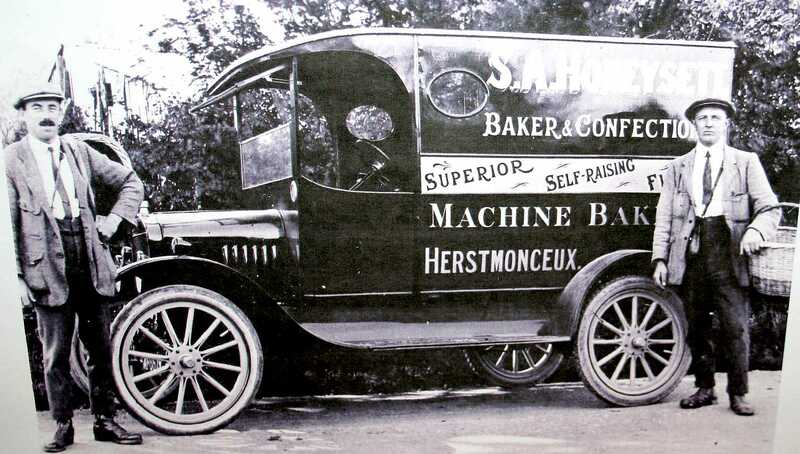 Electricity was being generated in Lime Park at this time, where we see that S. A. Honeysett is still advertising his "Machine Bakery," a reference to his electric machine ovens. On the horse drawn wagon the word "Electric" is included. By the 1920s, all the local customers knew that Herstmonceux was electrified - presumably giving a more controlled loaf bake.